A multitudinous number of things is a great many of them. Something or someone that is prolific is highly fruitful and so produces a lot of something. When visitors entered Elliot’s apartment, they were amazed by the myriad of science fiction figurines in his vast, seemingly endless collection. Elliot collected aliens mostly, and the myriad of countless small, plastic creatures covered bookshelves and wall space from floor to ceiling. When he ran out of room, Elliot bought a house in which there were a myriad of closets, shelves, bins, and other storage areas to contain his ever-growing collection. Quiz: Try again! When do you have a myriad of something? When you spend a long time gathering it. When there are a huge number of them or a great variety. When it is fascinating to other people. My Riot Ad My riot ad stirred up a riot that was so big that there were a myriad of people taking part in my riot. 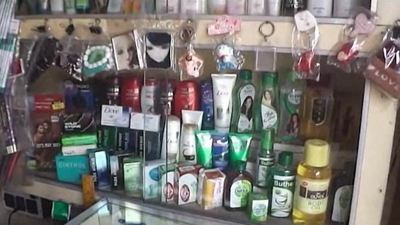 YouTube: LTV India (Raju's Variety Shop) A myriad of items for sale.